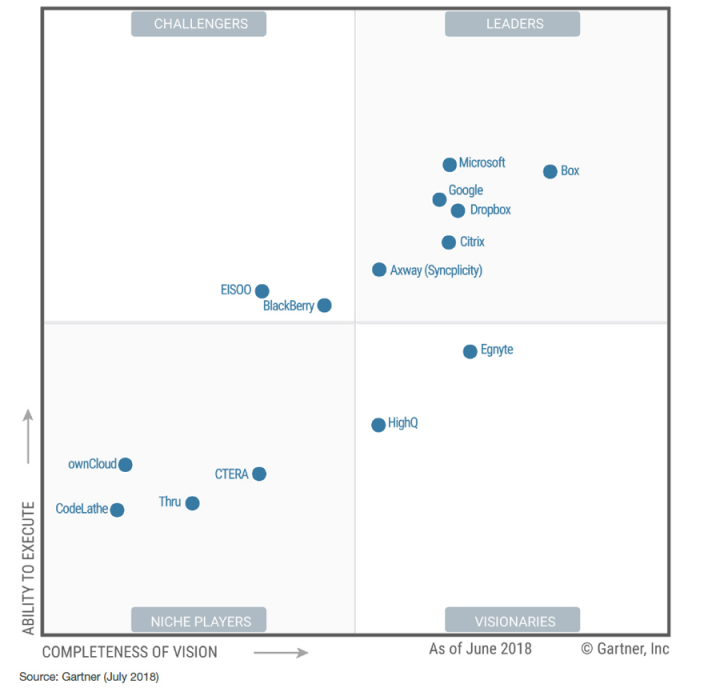 We’re pleased to announce that for the second consecutive year Gartner has recognized Citrix as a Leader in the Content Collaboration Magic Quadrant. When we were named a Leader in the inaugural report last year, we were just getting started with our evolution from an enterprise file sync and share tool to a content collaboration platform that supports all the document-centric tasks and workflows required by today’s modern enterprise. And this year, there are even more reasons for organizations to choose Citrix. This graphic was published by Gartner, Inc. as part of a larger research document and should be evaluated in the context of the entire document. The Gartner document is available upon request from here. Most organizations today are dealing with increasing complexity and challenges around data protection and security. Years of valuable data fills legacy applications and business systems, but those apps and systems make accessing that data difficult because they were not built to support mobility. Employees are bringing their own devices into the workplace and using a variety of business and personal apps. And all these disparate systems and apps expose organizations to security risks. The impact of these challenges is widespread as organizations struggle to support complex systems while modernizing technology infrastructure and providing access to tools that increase productivity and collaboration across their organizations securely. Content collaboration platforms strive to simply the technology landscape by providing a comprehensive solution for productivity and collaboration that connects employees and streamlines workflows. Our secure content collaboration platform lets people access all their files stored across multiple repositories from a single pane of glass so they can work efficiently from anywhere. ShareFile replaces or augments outdated systems and mobilizes multiple content repositories so you can skip the messy data migrations. Experience: Citrix understands that technology needs to be intuitive, and ShareFile provides a simple design with powerful capabilities to increase content efficiency in the digital workspace. Secure file sharing and collaboration. Securely share sensitive and large files using secure links, or initiate a structured workflow to automate the sequences of routine tasks. Anywhere access to files. From each application, desktop and device, users can access the same distributed file system, simplifying data access and management in all endpoints. External collaboration. Invite an unlimited number of clients or partners to a shared portal or workflow with activity-based notifications to eliminate unnecessary emails and the need for FTP. Structured workflows. Streamline and automate the collection and sharing of feedback, approvals, signatures, file collections, and medical images. Choice: Citrix supports organizations as they transition to the cloud and provides a single pane of glass for users to access all their data in one location. Data source choice. Select the unique combination of storage options, access, and retention to suit your organization’s investments and compliance needs, including cloud, on-premises, and hybrid infrastructures. Access all your data in one place. Connectors provide access to data stored on existing network shares, as well as personal cloud accounts, from any device, simplifying the way to access and securely share files. Security: Securing data, protecting users and devices, and meeting regulatory requirements is a top priority, and Citrix provides robust security features so you can protect intellectual property, govern and audit access, and maintain visibility and control of data across users, devices, files, and the content within files. Secure by design. Citrix provides authentication, encryption, remote wipe, and the ability to restrict devices. End-to-end security with Citrix Analytics and reporting. ShareFile collects information (events) on user behavior with documents: access, downloads, sharing, and this information can identify suspicious patterns and alert administrators. Information Rights Management (IRM): ShareFile adds watermarking option, ensuring secure access to sensitive content only by intended recipients. Data Loss Prevention (DLP): DLP helps organizations enforce regulated industry requirements, company governance policies, and security parameters for audit reporting and compliance. By providing a secure way to collaborate, ShareFile delivers a comprehensive content collaboration platform to help businesses of all sizes be productive and efficient. Note: Gartner does not endorse any vendor, product, or service depicted in its research publications, and does not advise technology users to select only those vendors with the highest ratings or other designation. Gartner research publications consist of the opinions of Gartner’s research organization and should not be construed as statements of fact. Gartner disclaims all warranties.